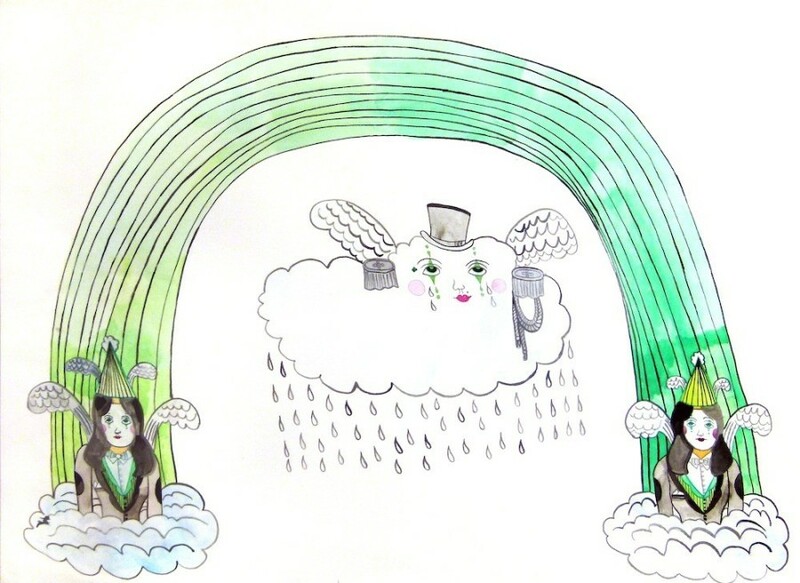 If you've perused The Huffington Post Arts & Culture page at all this week, you may have noticed the spread of outsider artists gracing the site. That's because this weekend is the 23rd edition of the Outsider Art Fair, one of the rare and peculiar occasions when the art world gathers to celebrate and explore artists who, by and large, are unaware of the art world's real, prickly existence. There are various ways to make sense of outsider art as a genre. Roberta Smith calls it "a somewhat vague, catchall term for self-taught artists of any kind." Lyle Rexer defines it as "the work of people who are institutionalized or psychologically compromised according to standard clinical norms" or "created under the conditions of a massively altered state of consciousness, product of an unquiet mind." Jerry Saltz argues it doesn't exist at all, except as a discriminatory boundary preventing untrained artists from their rightful places in the canon. Rebecca Hoffman, director of the Outsider Art Fair, has her own distinction. "I utilize the term 'outsider art' as an umbrella for a lot of different categories," she explained to HuffPost. "Primarily, what we term outsider art is self-taught or non-academic work. So, that could be somebody who is a mathematician who has taught himself how to paint. That could be somebody who [has severe autism] and expresses himself through drawing. That could be a member of an aboriginal tribe in Western Australia, a herdsman for her entire life, who painted prolifically for her final 14 years of life. That could be someone who was drawing to escape violence in New Orleans. It could be someone who took to marble carving to express all of the diverse experiences he's undergone." According to Hoffman's definition, which echoes the "catchall" mentality of Smith, the "outsider" classification hinges more on the artist than the art. While other genres like Abstract Expressionism or Cubism denote a specific set of aesthetic guidelines or artistic traditions, the label "outsider art" reflects more the life story and mental or emotional aptitude of the artist. 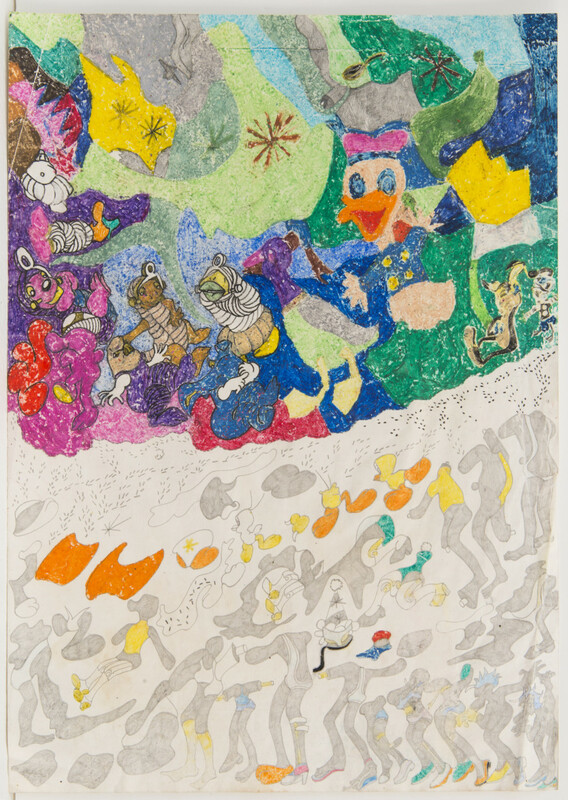 Outsider art lumps together a mishmash of people from wildly disparate places and times, similar only in the fact that they seem to struggle with a vague blanket of personal trajectories and inner demons. To complicate matters even further, most artists on view don't categorize themselves as outsider artists, or even realize their work is being seen and evaluated at all. "The art exhibited in our show was created out of a need to create art and a love for art, rather than art that's referencing cultural signifiers or informed by the institution or intellectual signifiers," Hoffman continued. It's this unifying aspect that often yields works that overlap aesthetically, despite the contrasting origins and experiences of the artists. Outsider art is, often, known to be naive, obsessive, visceral and autonomous -- dissociated from the artistic norms and trends that define the zeitgeist for those not impervious to it. After stripping away cultural conventions and the impending shadow of the artistic establishment, artists' deeper inspirations and messages come to the surface. And sometimes, oddly, they converge, hinting at some yawning humanity within us all. Certain words buzz around discussions of outsider art -- words like "naive," "pure," "raw," "visionary" and "fanatic." It's true -- we've used some of the above. While many of these characteristics hold true, they speak not only to the artist but the viewers, and their own ideas of what constitutes art making in its most idealized, authentic sense. Are they searching for the maniacal genius, isolated and misunderstood, creating beauty that stands outside of time and circumstance, untouched by the pettiness of everyday life and mainstream culture? After all, outsider art, at times, affirms the value and potential of art many artists and art lovers believe in and aspire to: it celebrates the outsider. It unveils the unadulterated act of creation, outside of norms and trends and anxieties and the desire for commercial success. It can convey the power of the unbridled imagination to create order, constitute beauty from basically nothing and even save a life. "Why look at outsider art and self-taught art, if not out of romantic nostalgia for some image of unfettered individuality and expressive freedom?" 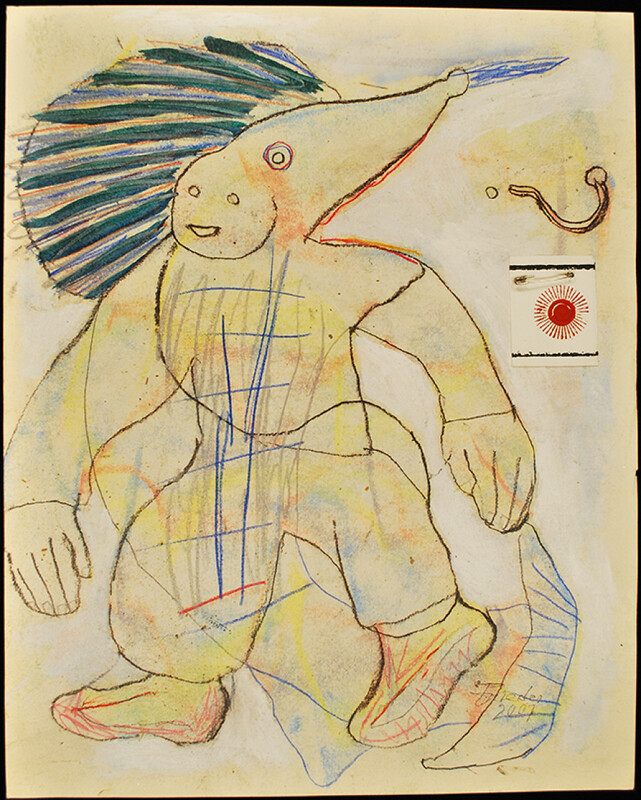 Lyle Rexer writes in How to Look at Outsider Art. "Or is our fascination with this art just one more form of voyeurism?" "I was basically born into the art world," Hoffman said. "My mother owns an art gallery and I grew up around art my whole life. I had reached a point where I got into the business of outsider art because I love that moment where a person clicks with a piece of art and falls in love with it. Maybe that's an old fashioned notion, but I wanted to have the opportunity to be involved with environments where people connected with art on a visceral level and all the other noise just stopped. I do think that happens more with outsider art. It's so pure in its need for creation." The characteristics accepted as deep-rooted in outsider art often converge with what's praised in "insider art." Vincent Van Gogh famously grappled with mental illness, making his work all the more cryptic and all the more gripping. Yayoi Kusama, who's experienced hallucinations since a young age, said "Painting saved my life," and makes art to this day in a mental institution. Jean-Michel Basquiat's crude style, dubbed "primitivist" at the time, shot him to meteoric art stardom. Kinshasha Conwill, director of the Studio Museum of Harlem, explained in The New York Times: "People did exploit his race and try to make him an exotic figure." 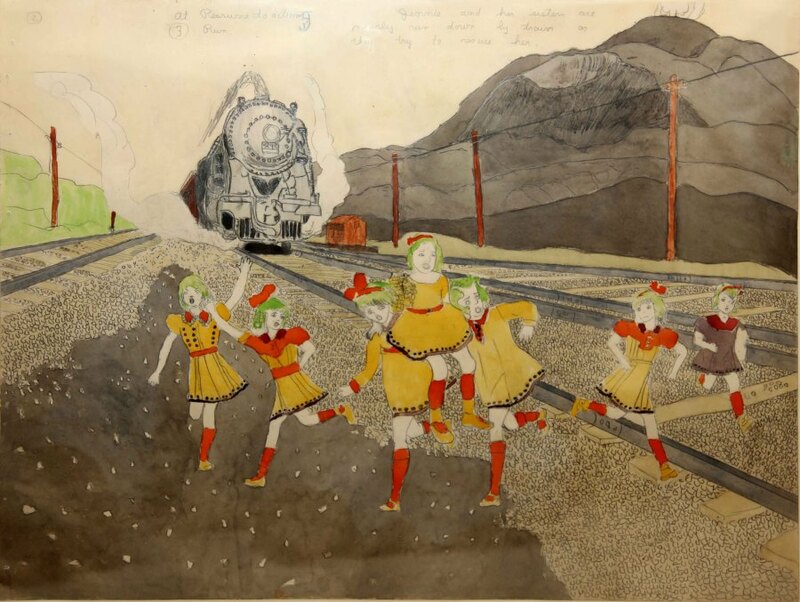 Are outsider artists, à la Saltz's initial conclusion, victims of a similar reduction? Otherness, individuality and darkness have long been venerated in the world of art; so, are outsider artists the apotheosis of this kind of exploitation? Or does the veneration of outsider art further lay bare a reality that's simply slipped under the rug in other circles? 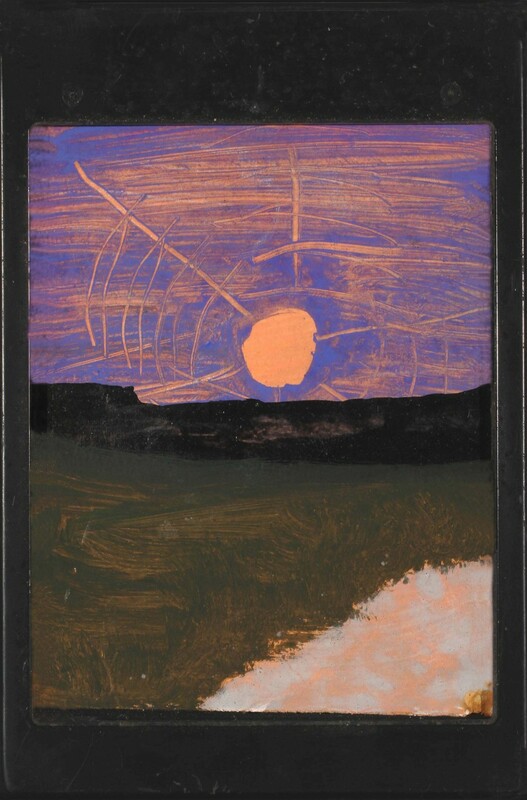 Landscape, Sunset over Black Mountain, Water color and oil on paper ( Polaroid box cover ), 3 13/16” x 3 ¼”. In the end, there is a dark side -- or at least a discomforting side -- to the quickly rising popularity of art explicitly made possible by suffering, whether of mind or physical circumstance. But there's also an undeniable magic to the ethos of the fair, a message that communicates that, at its core, art is by everyone and for everyone. It's not about clever allusions, MFAs, market trends and traditions that are constantly being overturned for the sake of overturning them. Through an outsider lens, art is about imagination and creation, generating worlds inside your mind and letting them free, transforming suffering into profound beauty. Because of the simplicity of the message, outsider art is also refreshingly unpretentious. "You look at fairs like Scope or Pulse or the Armory show, and they're all showing work that has been created in a vacuum where people paid attention to the artistic institution, where people pay attention to art historical practice, the chronology of development," Hoffman said. "The Outsider Art Fair is more approachable. There's a large percentage of the population who may not feel comfortable going to Frieze because they do not know the institution. Here, everyone is welcome." We should be careful about how we address, categorize and subconsciously idealize what's known as outsider art. But when it comes to seeing it in person -- as Hoffman is quick to point out -- we should never hesitate.